WHS Forum - Infront. Staffing & Container Services. This page is intended to provide WHS information and comments to ensure safe working environments across all sites that Infronts candidates work from. Have a comment or wish to report an accident or near miss? Please email whs@infrontstaffing.com and we will post all relevant comments in the forum below (chronologically from bottom to top). Click here to download a copy of the Infront Accident/Injury report. 18/09/2018 – PPE: Some sites do not insist on wearing PPE. Please note that regardless of the site policy, anyone working for Infront is required to wear steel capped safety boots and high vis vest/shirt/singlet whenever carrying out a shift that we have rostered you for. This is to help maintain your safety and we suggest you make it your own policy at other sites aswell. Simple accidents can happen and it is in all workers best interest to minimise the chance of injury by ensuring protective clothing is worn at all times while on a worksite. Please note that if you are found to be working on site for us without PPE, we will unfortunately not be able to offer further work to you, so please ensure you follow this strict policy. 31/7/2018 – Speed signs/limits are in place on sites to protect you and everyone else. There are blind spots and moving vehicles, machinery and people can appear very quickly without warning. Please always adhere to speed limits to minimise the risk of collisions which could result in serious injury and or damage. 6/01/2018 – SafeWork NSW has launched a forklift safety blitz following three deaths and more than 1300 injuries in two years due to poor forklift operational practice – see here for more information. 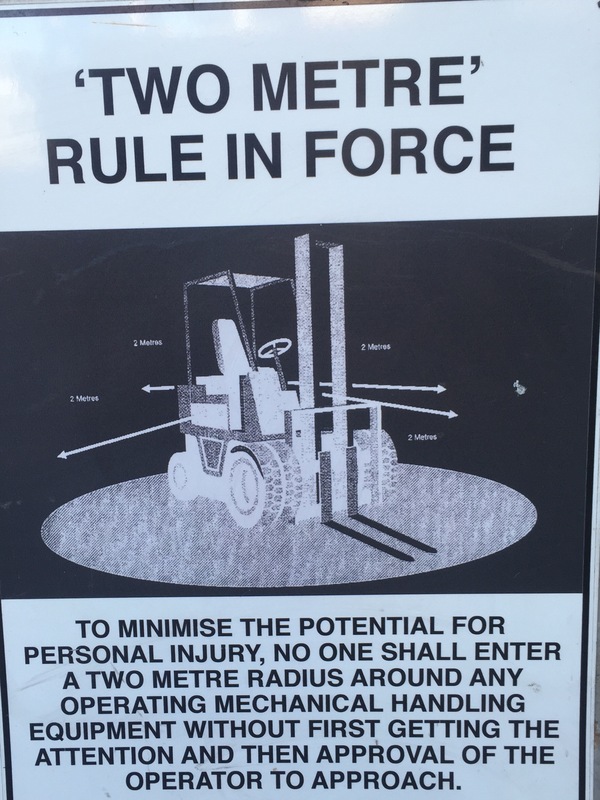 18/01/2018 – Just to make sure everyone has a clear understanding of the 2 metre policy regarding minimum distance required by anyone not operating a moving forklift, please click here. 23/11/2017 – We need to reiterate – Please under no circumstances is anyone to stand within 2 metres of a moving forklift (some sites will have a policy of even more than this which you must of course adhere to when on site). An incident has occurred today where a warehouse staff member was guiding a forklift with a wide load and in doing so has had his finger caught in a pinch point which has caused serious damage to the top of one of his fingers. Had he remained at least 2 metres away from the forklift this would not have happened. If you see other staff members failing to adhere to this policy please advise them to move away for the safety of themselves and all other staff in the area. 21/10/2017 – Even small hazards or accidents can pose a risk to your safety and health. A staff member recently scraped his toe when he trod on a nail whilst on a construction site. The individual was fine and worked for the rest of the day before attending a medical centre to have a Dr review his injury and get a tetanus shot and then returned to work the next day with no loss of work time due to his minor injury. Always keep in mind the importance of being aware of all your surrounding and the potential dangers whilst working on a construction site – or any work site for that matter. We also remind everyone of the importance of reporting to us and accidents or near misses, even when the end result does not cause injury. Thanks to the staff member and the host employer for keeping Infront informed and following the correct process of reporting all injuries or near misses. 14/08/2017 – Message to everyone….Forklifts are not designed to lift people, whether there is an empty pallet to stand on or not. This is dangerous not only to the person being lifted and the fork operator, but also to anyone else in the warehouse/working area. This is clearly stated in the process of obtaining a forklift license for obvious reasons. Anyone found to be doing this while working at an Infront site will have their work with us terminated immediately in the best of interest of safety for everyone. Please, under no circumstances is there to be anyone other than the forklift operator on any part of the forklift. 10/7/17 – meeting minutes from WHS committee quarterly meeting click here. 5/7/17 – Another forklift safety issue that all warehouse staff need to keep in mind. If a forklift operator is carrying a load that is large enough to block forward sight lines, the safest way to move the load is by looking over the shoulder and moving in reverse to where the load needs to be moved. Driving forwards without being able to see what is in front of you is dangerous and as with any fork accidents, could lead to serious injury or fatality. Please remember that the force and weight of a forklift with no load can crush what is in its way, even at slow speeds and let alone with a load. Please always maintain clear lines of sight around you when operating a forklift and as always, pedestrians stay at least 2-3m away from moving forklifts. Driver sightlines on forklifts – not everything is visible, pedestrians and drivers should always look both ways, pedestrians should maintain a safe working distance from forklifts, basically stay away from them wherever possible. Forklifts are not like regular vehicles – they turn differently and are several times the weight of a regular car. Watch the damage caused in the demonstrations they show – bones are literally crushed when pinned or run over by a fork. 29/5/2017 – The most dangerous industries to work in – we came across this article which while from two years back, highlights the most dangerous industries to work (click here). Note that transport, warehousing and construction rate as the top second and third most dangerous industries and again need to make sure that everyone remain vigilant with work safety. 18/4/2017 – A reminder to all employees that all incidents (accidents / near misses) must be reported to us immediately so that we notify host employers, investigate and implement or correct any process/procedures necessary. Click here to download a copy of the Incident Report and again please contact us immediately on 02 8252 7565. 8/3/17 – Your safety is also your responsibility: No matter how much policy, procedure, inductions, signage, supervision and overall WHS is put in place by employers, everyone needs to remember that they must also not only be aware, but contstantly focused on maintaining theirs and their colleagues safety at all times. Today we had a serious incident in which an employee was injured after falling off the side of a forklift that they were hanging onto while being driven by someone else. The people involved not only disregarded the principles of forklift safety they would have learnt when training for their forklift license, but also disregarded instructions by site management after being warned not to do this earlier in the day. In addition to this, their actions went against every policy included in Safe Work Method Statements on the safety of forklift operation, site policy and Infonts policy which dictates that everyone should remain at least 2 metres away from a moving forklift. The end result was a broken foot in two places after coming off the forklift awkardly and having the machine roll over the persons foot. Needless to say, the injury could have been far worse and even resulted in a fatality had the fall occurred in a different way. What we need to reemphasise from this is again that you must stay at least 2 metres away from a moving forklift, and that you must work with safety in mind at all times. Failure to do so is not acceptable and we will not be prepared to offer work to individuals who do not take safety in the workplace seriously. Please remember that safety is also your responsibility, if you see colleagues not working with safety in mind or acting recklessly, please contact us immediately in the office on 02 8252 7565. 9/2/17 – Return to work programs post workplace injury are essential for all businesses and all parties involved have responsibilities in ensuring workers are able to get back to work as quickly as possible once in a position to do so. Click here for information regarding return to work programs. Infront has a return to work management plan in place which can also be viewed here. 30/01/17 – Happy new year and welcome back to our forum, we look forward to a safe 2017.We would like to make sure that you are aware of what we can all do to look out for each other in the workplace. Below is a link to a SafeWork NSW page that provides very helpful ways at looking at what we can do to start talking about any potential hazards in your workplace. Remember that Infront are here to help in any way and if you at any stage feel uncomfortable doing a task, please stop and let us know immediately. We are contactable at all times and will make sure we either eliminate potential risk or minimise by providing alternative methods to carry the work out. Please contact us on 02 8252 7565 if you need to discuss safety at work at any time. Take a few minutes to review the following information. 23/12/16 – From SafeWork Newsletter issue #13 – Take Forking Safety Seriously “Out of all the injuries and fatalities, a whopping 33 of them involved pedestrians. This means people working around the forklift – either onsite workers or visitors to the site – like delivery drivers and contractors. Keep yourself away from forklifts at all times, and print out our free guide for people working safely around forklifts. It’s crucial that you only move a stable load and use the right attachment for the load. Check out our guide for forklift operators for more info.Belt up! 26/8/2016 – Forklift operators a reminder to make sure you ALWAYS engage the park brake when getting off the forklift. A simple mistake but one that could cause major damage and/or injury. A forklift left to role away out of control is obviously going to go straight through whatever it hits, whether that is a wall, another vehicle or worse still a person. 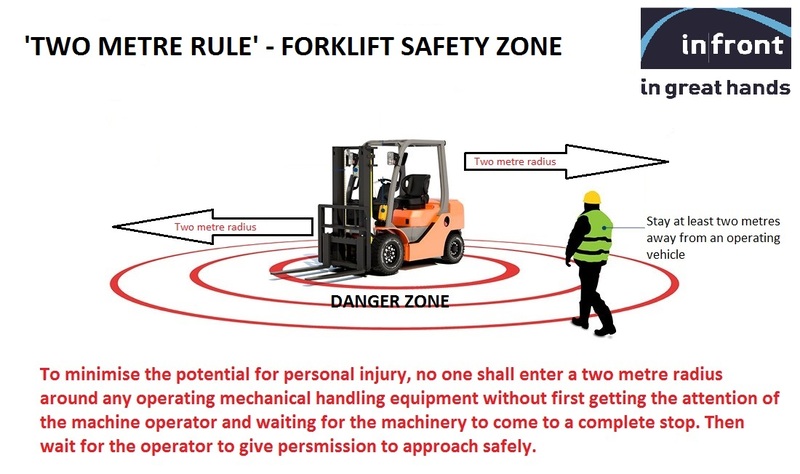 This is one of the basic fundamental rules for safe operation of a forklift and should never be forgotten. 17/5/2016 – SafeWork NSW research indicates that accidents with forklifts which were fatal or caused serious injury were consistently because of the following: People were hit by a forklift because of driver error, working too close to the forklift or inadequate traffic management, people were hit by the load a forklift was moving because they were assisting to adjust an unsteady load, or the driver did not use an attachment when one was needed, the majority of operators fatally or seriously injured in a tip-over were not wearing a seat belt. The forklifts mostly tipped because operators were turning on uneven or sloping ground. ALWAYS REMEMBER: To make sure forklifts and pedestrians are separated, make sure the load is stable, or use a suitable lifting attachment if needed, and make sure operators always wear a seat belt. 19/02/2016 – Near Miss: We have been advised of a second incident within the matter of two weeks where one of our workers on site has reported a Pantech truck taking a short cut through our clients dispatch area trying to avoid speed humps in the common driveway. These vehicles seem to be the same repeat offenders coming from the adjacent warehouse. Although no one has been hurt, we take these matters very seriously as we have a duty of care for employees and expect people to go home the same way they arrive to work. Safety is our number one priority for our staff. We have notified the host employer, and once again immediate action has been taken against the offending company in order to make improvements on the site. We will have further updates posted on our forum in regards to the situation being addressed and rectified. 11/2/16 – Reporting near misses: A reminder to all parties to ensure that all near misses, not just accidents are reported to your supervisors and to our office. We were recently advised of a near miss by one of our workers on site, involving cars encroaching on forklift operation areas when they should not be, as vehicle drivers were becoming lazy and were in too much of a hurry to leave the site at the end of their shift. Fortunately no accident occurred, however with the report of a near miss, the host employer has now made improvements on site (including additional signage & speed humps and addressed the issue in toolbox meetings), which have assisted in minimising the potential for a collision to occur. 23/12/2015 – Link to the SafeWork NSW SafeWork Wrap #04 below. The newsletter covers some interesting and informative articles regarding site inductions, working near overhead powerlines and container unpacking. Click here. The article regarding container unpacking also includes a safety alert video which should be viewed by anyone involved in packing or unpacking containers. 25/11/2015 – Correct manual handling technique: Manual handling on all work sites should be done correctly to avoid injury. Please take a look at this link to reinforce the correct techniques for lifting and moving items manually. 10/11/2015 – Moving machinery exclusion zones: To ensure your safety, please remember that it is company policy that you remain a minimum 3 metres from any moving machinery.